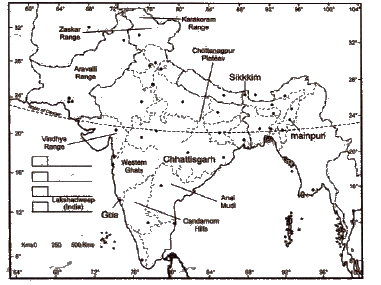 Get here NCERT Solutions for Class 9 Social Science Geography Chapter 2. These NCERT Solutions for Class 9 of Social Science Geography subject includes detailed answers of all the questions in Chapter 2 – Physical Features of India provided in NCERT Book which is prescribed for class 9 in schools. 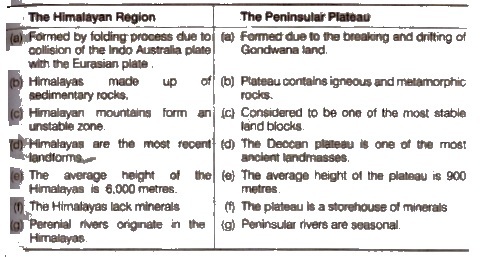 Class 9 Social Science (Geography) Chapter 2 Physical Features of India NCERT Solution is given below. Question 1. Choose the right answer from the four alternatives given below. (i) What are tectonic plates ? Answer The convectional currents below the Earth’s crust split the crust into a number of pieces. These pieces are called tectonic plates. e.g., Eurasia plate, Indo Australian plate etc. (ii) Which continents of today were part of the Gondwanaland ? Answer The Gondwana land included India, Australia, South Africa and South America as one single land mass. (iii) What is the Bhabar? Answer Bhabar is a narrow belt of land about 8 to 16 km wide and covered with pebbles deposited by the rivers and lying parallel to the slopes of the Shiwaliks. (a) The Great or Inner Himalayas or the Himadri It is a continuous range consisting of the highest peaks. (b) Himachal or Lesser Himalayas The range lying to the South of the Himadri is known as Himachal or Lesser Himalayas. (c) Shiwaliks The outermost range of the Himalayas is known as the Shiwaliks. These are the foothill ranges and represent the southernmost division of the Himalayas. (v) Which plateaus lies between the Aravalli and the Vindhyan ranges? Answer Malwa plateau lies between the Aravalli and the Vindhyan ranges. Answer Lakshadweep Islands are composed of small coral islands. 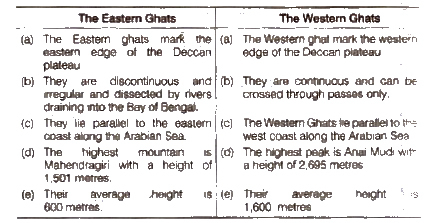 Answer Difference between the Eastern Ghats and the Western Ghats. Question 4. Describe how the Himalayas were formed. (a) The oldest landmass of India (peninsular part) was a part of Gondwana land. (b) Gondwana land included India, Australia, South Africa and South America as one single landmass. (c) Convectional currents split the crust into a number of pieces, thereby leading to the drifting of the Indo – Australian plate after being separated from the Gondwana land towards the North. (d) The Northward drift resulted in the collision of the plate with the much larger Eurasian plate. (e) Due to this collision the sedimentary rocks which were accumulated in the geosyncline known as the Tethys, were folded to form the mountain systems of Western Asia and Himalaya. (f) The Himalayas represent a youthful topography with high peaks, deep valleys and fast following rivers. Question 5. Which are the major physiographic divisions of India? Contrast the relief of the Himalayan region with that of the Peninsular plateau. Question 6. Give an account of the Northern plains of India. (a) The Himalayan uplift out of the Tethys sea and subsidence of the Northern flank of the peninsular plateau resulted in the formation of a large basin. In course of time, this depression gradually got filled with deposition of sediments from rivers flowing from the mountains In the north and led to formation of the fertile Northern plains. (c) It is a densely populated and an Intensively cultivated area. (e) The Northern plains are broadly divided into 3 sections. (f) The Western part of the Northern plans IS called the Punjab plains, formed by the Indus and its tributaries. (g) The Ganga plain extends between the Ghaggar and the Teesta rivers, spread over the states of Haryana, Delhi, UP Bihar and West Bengal. The Indian desert lies towards the Western margin of the Aravalli hills. It is an undulating sandy plain covered with sand dunes. This region receives very low rainfall, below 150 mm per year. It has arid climate with low vegetation cover. Streams appear during the rainy season. Soon they disappear into the sand as they do not have enough water to reach the sea. Luni is the only large river in this region. Barchan (Crescent shaped dunes) cover the larger areas but longitudinal dunes become more prominent near the Indo – Pakistan border. The Indian desert is popularly known as the Thar desert. The Peninsular plateau consists of two broad divisions, namely the central highlands and the Deccan plateau. The part of the Peninsular plateau lying to the north of the Narmada river covering a major area of the Malwa plateau is known as the Central Highlands. They are bound by the Vindhya Range from the south and by the Aravalli hills from the north-west. The further westward extension gradually merges with the sandy and rocky desert of Rajasthan. The flow of the rivers draining this region, namely the Chambal, the Sind, the Betwe and Ken is from south-west to north-east. The eastward extensions of their plateau are locally known as ‘Bundelkhand’ and Baghelkhand. The Chhotanagpur plateau marks the further eastward extension drained by the Damodar river. India has two groups of islands namely the Lakshadweep group and the Andaman and Nicobar group. (a) The Lakshadweep Islands Group lie close to the Malabar coast of Kerala. These islands are composed of small coral islands. Earlier, they were known as Laccadive, Minicoy and Amindive. In 1973, these were renamed as the Lakshadweep. They cover a small area of 32 sq km. Kavaratti Island is the administrative headquarters of Lakshadweep. This island group has a great diversity of flora and fauna. The Pitti Island, which is uninhabited, has a bird sanctuary. The elongated chain of islands located in the Bay of Bengal extending from north to south are the Andaman and Nicobar Islands. They are bigger in size and more numerous and scattered than the Lakshadweep Islands. The entire group of islands is divided into two broad categories, the Andaman in the north and Nicobar in the south. It is believed that these islands are an elevated portion of the submarine mountains. These islands are of great – strategic importance for the country. They have great diversity of flora and fauna. These islands lie close to the equator experience equatorial climate and have thick forest cover. (i) Mountain and Bill Ranges The Karakoram, the Zaskar, the Patkai Bum, the Jaintia, the Vindhya range, the Aravalli and the Cardamom hills. (ii) Peats K2, Kanchenjunga, Nanga Parbat and the AnaMudi. (iii) Plateaus Chhotanagpur and Malwa. 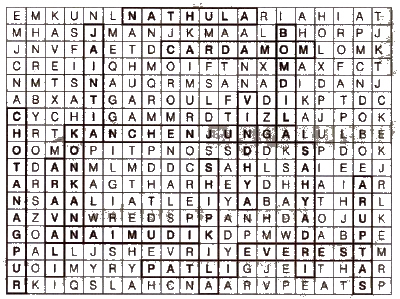 Locate the peaks, passes, ranges, plateaus hills and duns hidden in the puzzle. Try to find where these features are located. 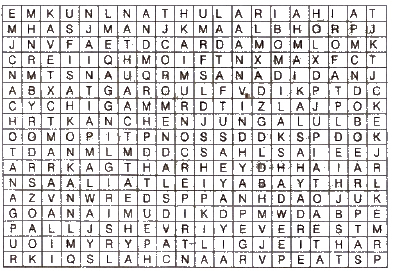 You may start your search horizontally vertically or diagonally.